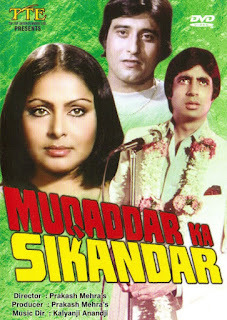 Staring - Amitabh Bachchan, Vinod Khanna, Rakhi, Rekha , Kadar Khan, Ranjeet and Amjad Khan. The Time Of It's Release.Movie was Blockbuster and Third Highest Grosser Of that Decade After Sholay and Bobby. Movie Nominated For Filmfare Award Many category Like Best Movie , Best Director , Best Actor , Best Supporting Actor , Best Music And Best Actress.